Smardt (founded in Montreal, Canada in 2005 to focus on oil-free centrifugal chillers) and PowerPax (founded in Melbourne, Australia in 2000 as a specialist heat-exchanger group), joined forces during 2005 to form the Smardt Chiller Group. After several years of rapid growth, an additional Smardt factory was opened in Plattsburgh, New York in 2010, and a sales and service operation opened in Singapore. In 2011, Smardt acquired the well-known OPK Klimatechnik business in Stuttgart, Germany – an outstanding European pioneer in oil-free centrifugal technology. In 2012, Smardt’s China manufacturing operations opened in Guangzhou, Guangdong. In 2015, Smardt partnered with the highly regarded Brazilian chiller manufacturer Transcalor, to sell and manufacture Smardt’s chiller technology in Brazil. In 2016, Smardt entered into a partnership with Euroklimat (EK) – the largest European brand in China with 29 branches across the country – to develop, manufacture and sell Smardt chillers under the Smardt-EK brand. 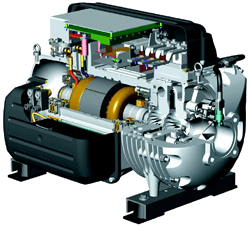 The heart of every Smardt chiller is its Turbocor oil-free centrifugal compressors, which integrate rugged magnetic bearings systems with variable-speed drive, high-efficiency centrifugal compression and on-board digital electronics to achieve a revolutionary leap, a quantum leap, in part-load energy efficiency. All Smardt chillers, whether water‑cooled, air‑cooled or evaporative, are designed to optimize the performance of oil-free centrifugal compressors from Danfoss Turbocor Compressors Inc. These use oil-free magnetic bearings and variable-speed drives to deliver better IPLV efficiencies than conventional oil-lubricated centrifugal, reciprocating, scroll and screw compressors. They are also high speed – up to 48,000 rpm, very compact, very quiet, rugged and reliable. Power factor is a high .92. Proprietary magnetic bearings replace conventional oil-lubricated bearings, eliminating high friction losses, mechanical wear and high-maintenance oil management systems to deliver energy savings of 35 percent and more over conventional chillers while ensuring long-term reliability. Over 90,000 magnetic bearing compressors are operating in the field, mainly in high-end vacuum pumps and CNC spindles – any innovation risk with this component technology has been long overcome.